The concept for this project came from a pretty simple place: I have a lot of really talented friends who are doing some really amazing things, and I want to tell their stories. From musicians to bike builders, surfboard shapers to barbers, the common thread is that these are passionate people who have dedicated their lives to doing what they love. Whether its how they make their living, or a weekend side gig, the creative expression is the same. Scotty Stopnik may have said it the best, “It’s a weird thing to be inspired to do something”. It’s a hard thing to put your finger on, what exactly drives you to create? What drives you to put so much time, energy, and passion something for no reason other than the fact that you love doing it? For myself, it comes from these people, from friends who are pursuing their own creative passions. Seeing their work, hearing their music, learning of their upcoming projects, all of it drives me to pick up a camera, take a photo, edit a video, or tell a story. For myself, and what I have found as a commonality for everyone through this project, inspiration often comes from the company we keep. The stuff I have learned about how ones mind works is being a creative thinker and having a more lineal approach to something is left and right brained, and I really find the beauty when those two start to dance. Walk into Donald Brink’s shaping bay and you’ll be hard pressed to find a surfboard that looks much like anything else out there. It’s not that Donny couldn’t build your standard thruster, he just doesn’t want to. He enjoys the task of unlocking a new design, of taking an idea in his mind, sketching it out for a client, and creating a fully function, one of a kind piece, designed to perform. Donald’s track in surfboard building has a clear start from his youth. While very much into painting and music as a kid, Donny always had a mind for how things worked, and when he began surfing the transition was natural. He wanted to figure out why certain boards worked a certain way, what made a quad faster, what made a squared off rail different. Both music and skating are once again a family affair for the Hennings. Their two sons often sit in on jam sessions and can always be found at the skate park with dad. As they raise their family, Steve and Jessie have placed a huge focus on keeping them in a creative environment. They boys might not be able to actually play any songs yet, but it’s more about the experience they are having. Now when they all play together, in the living room or at a gig, the focus is to invite a mood into the room and leave people with something they remember. Sometimes a conscious change in life can lead to a lot more than we expect. For Scott Young, that all started with the decision to pursue barbering. Scott, an early client of Kings Club Barber Shop in Dana Point had been noticing and empty chair in the shop for a while, and feeling the need for a change in life figured he might as well ask the owner Mike about it. “One day I just thought it’d be a good direction to go… it kind of seemed like it would fit my lifestyle. I hit him up one day and asked what was up with that empty chair.” Mike said that he was just waiting for the right guy and Scott figured that was him. A year later Scott graduated barber school and as promised Mike had the chair waiting for him. For years before this Scott had been playing music, spending about 5 years with one band, writing all of the songs, playing guitar, and living out the grind of a gigging musician. “There was a time in my life where the juices were flowing and music was being created, but eventually that dried up.” A constant schedule of shows meant that they began playing the same stuff over and over, killing the love of playing and writing music for the guitar. A new wife and a budding career as barber eventually put a much-needed end to the touring lifestyle. However the love of music and the need to create never left, so Scott decided to recreate the excitement he once had, by learning to play the accordion. Soon after, a client of his began coming in and talking about the band he was in. He gave Scott a CD, but like it so often happens Scott tossed it aside. Eventually, after enough persistence, Scott gave it a listen and was blown away. It was folky, Irish, Americana, all sang with so much soul and conviction. Scott immediately shared it with and old band mate who talked him into setting up a jam session. The pieces fell in place and created what is Vinnie and The Hooligans. Music has taken Dustin far and wide, including a few summer stints in Montauk where he began DJ’ing with Mike D (yes, the Mike D). Now its back on the West Coast, where among other projects, he’s started a band with Marc Ford. 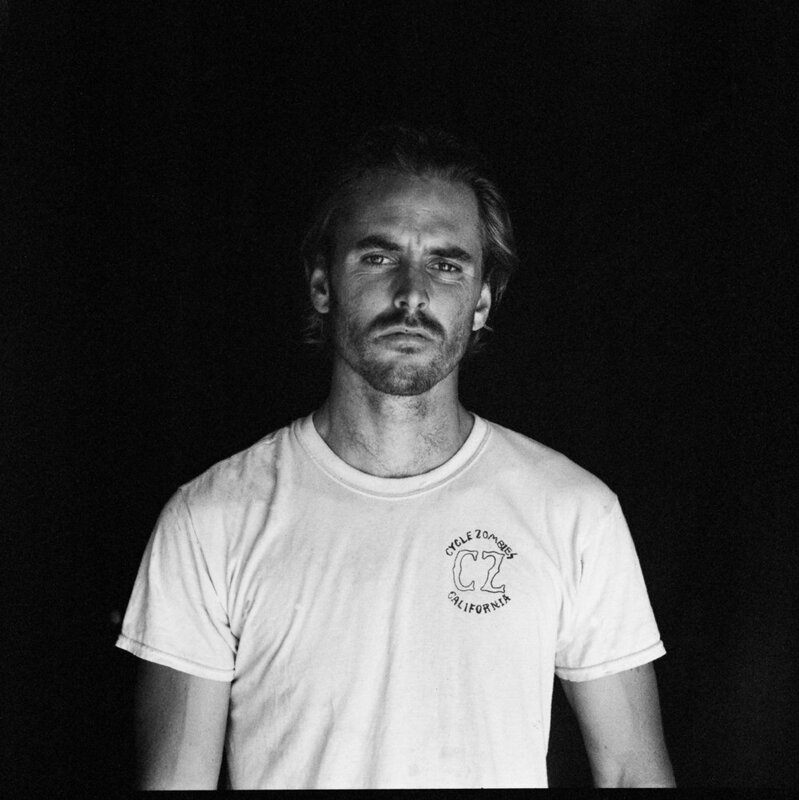 Dustin still surfs and plays music with a lot of those old friends, drawing influence and inspiration all from the little hot bed of San Clemente. Ask Scotty Stopnik what he does for a living and you might not get a clear answer. Not that he’s trying to be aloof or give you the run around; it’s just that there isn’t really a definitive answer to it. While “surf brands” have been the main source of income for much of his life, and he does indeed run stickers on his boards, Scotty hardly relates to being a pro surfer. Sure he surfs, very well, but he also builds custom motorcycles, he runs a company called the Cycle Zombies with his brother and cousin, he hunts swap meets for anything he can turn around and sell, he draws, paints, skates, acts, does stunt work–he hustles. “I surf and goof around and build motorcycles and ride them,” says Scotty while checking the waves in his hometown of Huntington Beach. “What you want to do for work is something you love to do, and I’ve done it for 15 years”.